Ùlpan is a new and refreshing Gaelic Language teaching technique that focuses on speaking and listening rather than grammar and writing. At the end of summer 2013, The Trust managed to secure funding to train 4 locals to become Ùlpan tutors. 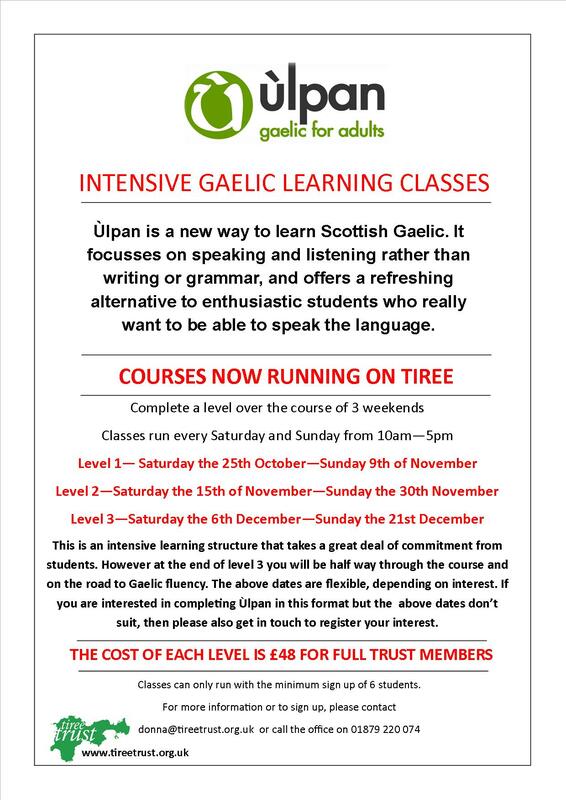 Over the winter, around 12 local residents completed the first two levels of the course, and are now one third of the way to Gaelic fluency. There has been lots of local interest in the courses and we are very impressed with the pupils that have undertaken classes so far. Below is an update of the latest courses running on Tiree. If you are interested in completing the Ulpan structure but the dates below aren’t suitable then please still register your interest with us at The Trust.